Alexion Pharmaceuticals will apply Dicerna Pharmaceuticals’ GalXC™ platform to discover and develop RNA interference (RNAi) therapies for complement-mediated diseases, through a collaboration that could generate more than $637 million for Dicerna, the companies said. The companies’ agreement gives Alexion exclusive worldwide licenses, plus development and commercial rights, to two Dicerna preclinical, subcutaneously-delivered GalXC RNAi molecules. Alexion and Dicerna agreed to partner on discovery and development of the subcutaneously delivered GalXC RNAi molecules directed to two complement pathway targets for the treatment of complement-mediated diseases. Alexion also retains an exclusive option to develop preclinical GalXC RNAi molecules for two additional targets within the complement pathway. Dicerna will lead the joint discovery and research efforts through the preclinical stage, and Alexion will lead development efforts beginning with Phase I studies. 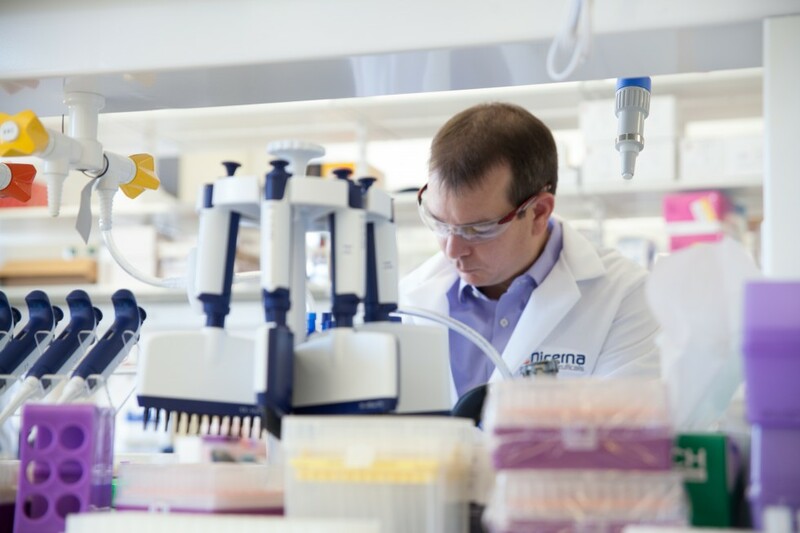 “This collaboration provides the opportunity to continue building on our more than two decades of complement expertise using Dicerna’s proprietary GalXC RNAi technology platform, which provides a potentially promising new way of inhibiting the uncontrolled complement activation that we know plays a significant role in many devastating diseases,” John Orloff, M.D., Alexion EVP and head of R&D, said in a statement. That approach, Dicerna announced last month, generated positive preliminary results for its lead GalXC product candidate in an ongoing Phase I trial (NCT03392896). “Having recently demonstrated clinical proof-of-concept for DCR-PHXC, our lead program for the treatment of primary hyperoxaluria, we are eager to expand and advance our pipeline of innovative GalXC therapies, including both proprietary and partnered programs,” added Douglas M. Fambrough, Ph.D., Dicerna’s president and CEO. GalXC is designed to advance the development of next-generation RNAi-based therapies designed to silence disease-driving genes in the liver. According to Dicerna, compounds produced via GalXC are intended to be applied across multiple therapeutic areas, including chronic liver diseases, rare diseases, cardiovascular diseases, and viral infectious diseases. GalXC molecules are structured to be processed by the enzyme Dicer, the initiation point for RNAi in the human cell cytoplasm. GalXC-based therapies are processed by the Dicer enzyme, which is the natural initiation point for RNAi within the human cell. Using GalXC, Dicerna researchers attach N-acetylgalactosamine sugars directly to the extended region of the proprietary Dicer substrate short-interfering RNA (DsiRNA) molecules, yielding multiple conjugate delivery configurations that according to the company allow flexible and efficient conjugation to the targeting ligands while stabilizing the RNAi duplex. Option exercise fees of up to $20 million—up to $10 million for each of the additional targets selected. Development milestones of up to $105 million for each product. Aggregate sales milestones of up to $160 million. Alexion also agreed to pay Dicerna royalties on future product sales ranging from mid-single to low-double digit percentages. Alexion said the Dicerna collaboration was one reason why the company today lowered its GAAP earnings per share (EPS) investor guidance for 2018 to between an 8 cent-per-share loss and 26 cents per share gain, from $1.25 to $1.50 per share. The company offered other reasons for the downward revision: The planned up-to-$1.2 billion acquisition of Syntimmune, announced last month; foreign currency fluctuations expected to cost the company $10 million; and a $90 million to $110 million hit against revenue for its flagship drug Soliris® due to recruitment for clinical trials for Ultomiris™ (ALXN1210) and other candidates. Ultomiris is under review by the FDA, the European Medicines Agency, and Japanese regulators for paroxysmal nocturnal hemoglobinuria (PNH) in adults. The FDA has set a Prescription Drug User Fee Act (PDUFA) date of February 18, 2019, under an expedited eight-month review following the company’s use of a rare disease priority review voucher. A Phase III study of Ultomiris in children and adolescents with PNH has been launched (NCT03406507). Alexion announced the Dicerna collaboration on the same morning it released third-quarter 2018 results above analyst expectations, and raised its forecasts for annual revenue, “adjusted” or non-GAAP EPS this year, and Soliris revenues. Alexion finished Q3 with net income of $330.9 million, more than quadruple the $78 million of the year-ago quarter, on revenues that jumped 20% year-over-year to $1.027 billion, surpassing the FactSet consensus of $1.02 billion. The company now projects revenue ranging from $4.02 billion to $4.05 billion, up from earlier guidance of between $3.98 billion to $4.01 billion. Non-GAAP EPS is now expected to range between $7.45 to $7.60, up from the $7.00 to $7.15 previously estimated. Soliris revenues are now forecast at between $3.46 to $3.48 billion, up from between $3.42 billion to $3.44 billion. During the first nine months of 2018, Soliris racked up $2.586 billion in net product sales, up nearly 10% from $2.352 billion in Q1-Q3 2017.